Material handling could be considered a simple term for a sophisticated set of applications. Regardless of the level of intricacy, the ultimate goal is to move a physical object from point A to point B. All material handling systems require a few simple things: reliability, predictability, compactness, and flexibility. The interoperation of machine and material handling units is becoming more and more important. Handling modules are being increasingly implemented in the form of industrial robots or as integral handling solutions. The advantage is clear: The machine and material handling functions can be controlled with a single system. Siemens provides innovative answers to new hardware and software requirements with control and drive systems, assuring highest product quality and maximum productivity, even with short product changeover cycles. The results are more efficient and more versatile production processes. The requirements for handling tasks are numerous – from the basic functional scope, such as the simple positioners integrated into the drive through general motion control functions, to interpolating path axes for pick and place. Based on an extensive control and drive portfolio, Siemens can offer the most custom solution for your handling task. Whether it involves simple feed axes, complex mechanical systems with SIMOTION and the SINAMICS drive family you have the optimum platform for first-class handling solutions. 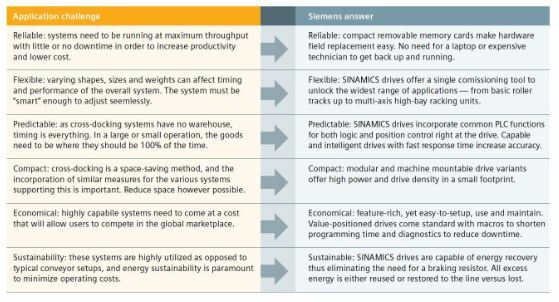 To learn more about Material Handling with Siemens, download the brochure HERE. This entry was posted in News and tagged Material Handling, siemens by SE Automation. Bookmark the permalink.